Find out which metal roofing option is best suited for your project. 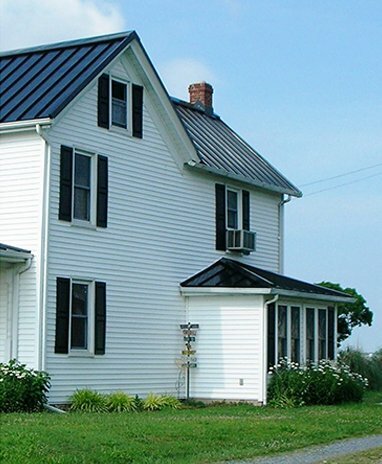 See the improvements we’ve made over the years by adding metal roofing to homes and businesses. Bring your dream project to life with Fabral’s color visualizer and product selection tool. Weaver’s Construction, Inc is a Felton, DE based small local business specializing in metal roofing. We serve all of Delaware, providing quality metal roofing products and expert installation on light commercial and residential projects. Our superior workmanship and expertise makes us the number one choice for custom home builders and home owners who want to improve their homes with the visually appealing and long lasting economic benefits metal roofing has to offer. With 20+ years of experience in the metal roofing industry, Weaver’s Construction, Inc can help you decide which type of metal roofing would be the best choice for your home or a home improvement project and your budget. From the first time you contact us we will do our best to answer your questions as quickly and informatively as possible. We remain committed to answering any questions or concerns our customers may have throughout the installation process and beyond.Our installers are professional, courteous and respectful employees of the company. We take great pride in what we do and we stand behind our work. With more than 22 years in the metal roofing industry we have the experience, knowledge and skills to handle every aspect of residential applications as well as intricate, detail oriented, custom metal work. There are many options available to give your home a unique, one of a kind look. Our specialty is hand crafted Copper Roofing and accents. Tell us your vision and we’ll make it happen! © 2019, Weaver's Construction, Inc. All Rights Reserved.